I am going to cover several aspects of the build but will take some things out of order, mostly due to waiting on parts to arrive. Today I started on hanging the suspension. The 2001 had the big brake kit so the rotors and the calipers will have to be swapped out. Starting in the rear, I wanted to replace all the alignment bolts. At this point I want to start out with all new hardware. In the process, I found a bent lower control arm. So will replace the control arm. It is not that bad but why start out with something bent. Before I assemble the control arm, I am going to press in new bearings. I use a 20 ton press, and the first few times you do this you can make some mistakes. 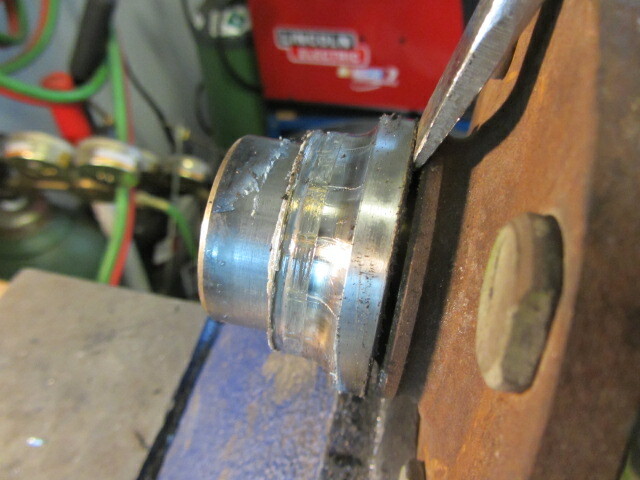 Step one, is to press out the hub, from the bearing, when the hub comes out it takes the race with it. Once the hub is out, you have to remove a snap ring on the hub side so that you can then press out the remaining bearing from the back towards the front. Now to get ready to install the new bearing, you have to drive the old race off of the hub. I use a chisel to move the race off of the hub, once I get it started I can use an air hammer to drive the race off. By the way the most helpful tool to me for remove axles or anything that is stuck or driving off pressed on parts in a transmission is the Air Hammer. Love that tool. I am now ready to install the bearing. 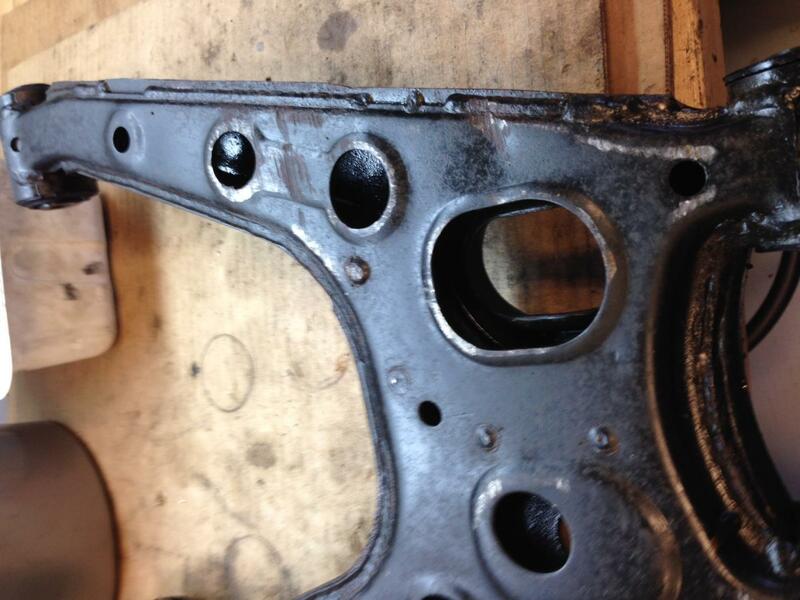 Its important to install it with the closed seal to the inside or diff side of the knuckle. 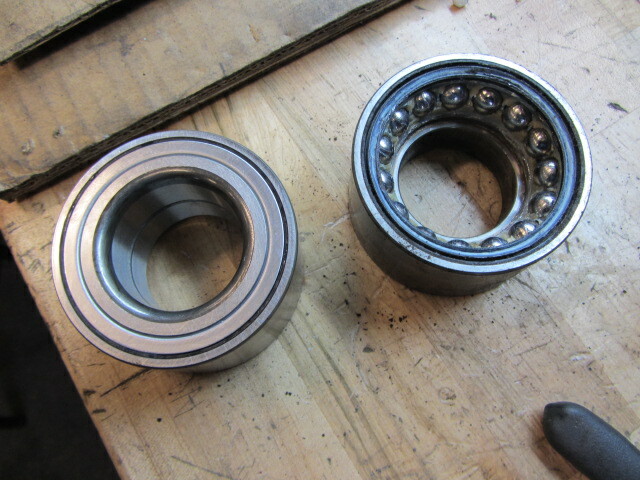 So the process is in reverse, you first press in the bearing into the bottom of the Knuckle, once its home you then press the hub into the bearing. 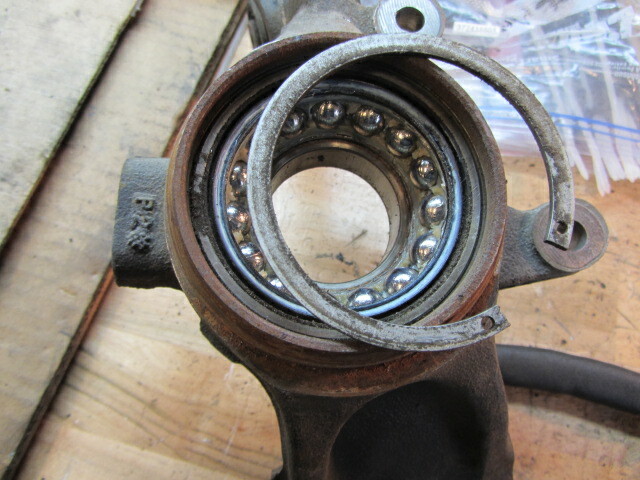 Be sure to back stop the bearing (and not the knuckle) when you press it in or you will drive the bearing right out of the knuckle. I make it a point to replace the rear bearings once a year. If i do not they will fail at some point. I have ran original bearings for awhile but since this car was flooded, I did not want to take a chance on it. 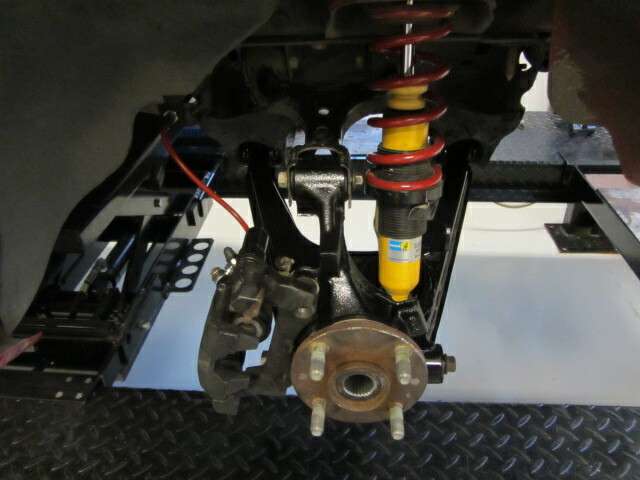 Now i have the rear suspension hung, and will be ready for when I install the Diff and the rest of the drive train. Just one last note about installing the shocks. Fat Cat has pictures online to be sure you install the bump stops correctly. It is Important to use thread locker on the shock shaft nut. They will back off if you do not. 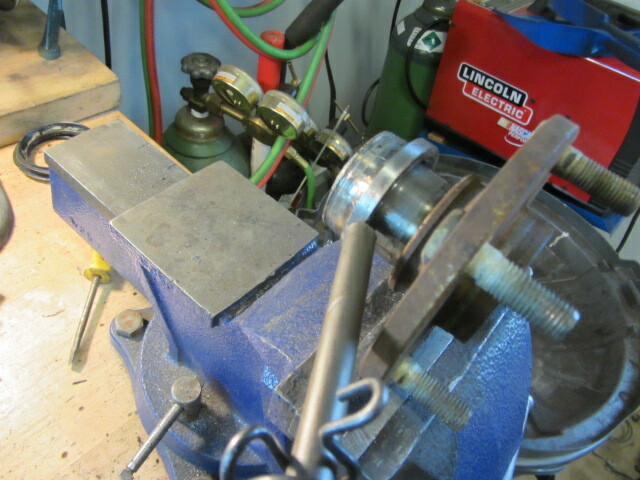 I also take a piece of rubber hose vice grips to hold the shaft when I tighten the nut on the top of the shock.